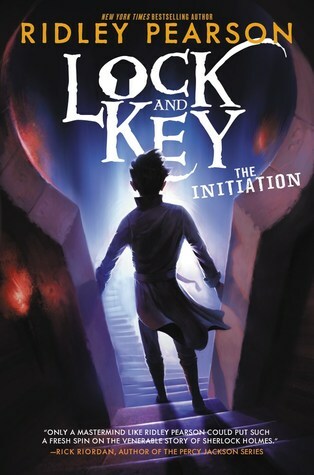 Lock and Key: The Initiation by Ridley Pearson. HarperCollins, 2016. Paperback. 386 pages. Sherlock Holmes is a well-loved detective character that has been featured in countless books, television shows, movies, and many other forms of entertainment. James Moriarty is the prolific criminal mastermind and nemesis of Holmes, and his role has been increased in many subsequent works of fiction based off of Sir Arthur Conan Doyle's original. Lock and Key brings the classic feud of Sherlock Holmes and James Moriarty to the present day, where the two attend Baskerville Academy and are placed together as roommates. The two do not hit it off, and James takes an immediate dislike to Sherlock's observant and somewhat arrogant nature. The story kicks off when the headmaster of the school announces that a valuable Bible has been stolen, and not long after this announcement James begins to receive mysterious red envelopes with difficult riddles that he must attempt to solve. The story, however, is not narrated by James, - as one might expect - but is instead narrated by his younger sister, Moria. I found this to be quite a clever idea, and it worked well for a majority of the novel, though it did become a bit confusing in certain narrative events and seemed to be forgotten about sometimes. I also would have liked to read this story from James' perspective, considering the book is essentially centered around him and his own journey from a loyal companion to his sister at their home to a harsh, troubled boy at their new boarding school. Despite this, reading from Moria's perspective gives the reader some unique perspectives on various events that occur, and also shows us how both James and Moria change over the course of their stay at Baskerville, though in two very different directions. It makes me wonder if it would have been possible for James to not become as hateful as he did, or if this was just in his nature. Pearson excellently captures Sherlock's sharp, impossibly intelligent mind and also greatly enhances his arrogance - in fact, Sherlock is not the most likable character in many instances. But then there is also the rather unlikable James Moriarty as well, who acts as both a contrast and a similar character to Sherlock. Both boys are stubborn and fairly sure of themselves, and neither one likes to show any form of weakness, which in fact seems to be a weakness in itself. My main problem with Lock and Key was how long-winded it became. I appreciate the fact that Pearson put so much effort into creating an extremely intricate story with many details, but it just became too confusing as the book progressed past the promising beginning. I found myself somewhat bored in many various periods of tediously long explanations and dialogues. This is marketed as a children's book, but I can see younger readers becoming a bit bored with this one, despite the initial hook and strong beginning. For mystery fans, Lock and Key is filled with a perfect combination of ingredients: anonymous clues in the form of riddles, a secret society, enigmatic characters, and a slew of difficult problems to solve. Overall, I am giving Lock and Key three stars; while it was enjoyable, the confusing parts in the latter half of the novel and extensive explanation hindered my enjoyment a bit too much for me to give it more stars. Get more reviews and bookish fun in your inbox and subscribe to Forever Lost in Literature! Too bad this wasn't better written (or maybe better edited?) The premise sounds fun.